Get Commercial HVAC service in Spring TX at 281-876-9400! Certified Technicians with years of experience and training on servicing commercial HVAC systems. Maintenance, repair, and replacement services for commercial HVAC systems. Competitively priced Service Contracts that will allow us to keep your commercial HVAC system system in tip-top-shape year-round. Houston Admiral is pleased to offer businesses in the Spring TX, Tomball TX, and The Woodlands TX areas benchmark 24 hour HVAC services. Your Spring, TX commercial HVAC system will command nearly half of your business’ energy usage every month. Therefore, it is important that your system is operating at maximum efficiency. An inefficient commercial HVAC system will not only deprive your business of a comfortable environment, but also erode any money savings your business could enjoy as you will have to accommodate your budget for maintenance and upkeep costs. Since 1990, we have serviced strip malls, schools, churches, schools, factories, machine shops, various national accounts, and franchisees, with high level preventive maintenance, system repairs, and system replacement. You can count on Houston Admiral to provide incredible commercial HVAC system maintenance, 24 hour system repair, and system replacement at competitive prices. We’re also the home of the Lifetime Warranty — the only commercial HVAC system contractor to provide one in the Greater Houston area. Make sure that your commercial HVAC system is operating properly with consistent maintenance. Houston Admiral is pleased to offer Service Contracts for Commercial HVAC customers. Why is a Service Contract for your Spring, TX commercial HVAC system a good idea? Competitive, consistent labor rates — peace of mind for your business’ bottom line with 24 hour emergency service. Consistent service — with regular maintenance, we’re able to catch problems before they become bigger problems. Houston Admiral’s Certified Technicians are knowledgeable in various commercial HVAC system brands and we also are an authorized RUDD® dealer. We service all system makes, including RUUD, Lennox®, Goodman®, and Trane® — just to name a few. 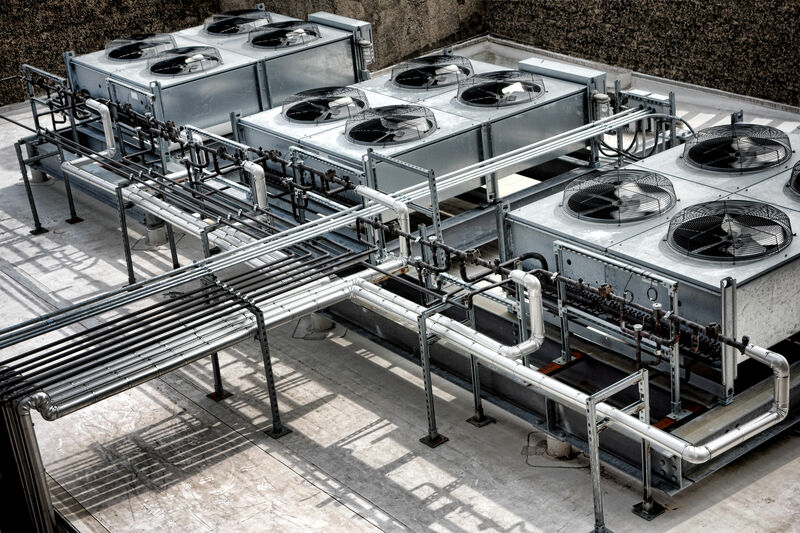 From complex systems, to duct work, ductless systems, refrigerant, to outdoor and indoor installations, you can count on Houston Admiral to provide the service and care that your commercial HVAC system needs. Sheet Metal & Air Conditioning Contractors’ National Association provides our industry with a high, trusted standard for the installation of commercial duct systems, including indoor and outdoor installations. Houston Admiral complies with SMACNA standards in all of our installation work.